Assignment: Create a series of quick studies of a figure. Pay close attention to forms, and weight distribution of the figure. Look for gesture of overall movement of the body rather than details. Lines should be quick and move back and fourth over forms throughout. 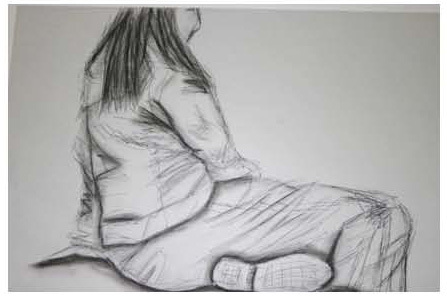 Emphasis is on capturing the pose, the weight shift, and expression of the body. Then, simple tone can be laid in to solidify the forms, or it an be laid around the figure in the negative space. A multitude of approaches will be introduced, including drawing with two pencils in hand, drawing with reed pens and ink, and drawing with the opposite hand on is used to holding the pencil with. Poses will vary from 30 seconds to 6 minutes in length.